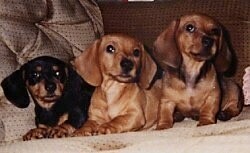 There are three varieties of Dachshund: the shorthaired, the wirehaired, and the longhaired. With each of these varieties there are three sizes. (See Height and Weight.) The Dachshund's body is longer than it is tall, muscular with short legs. It has an elongated head and a slight, convex skull that is arched with protruding eyebrows. The muzzle is long. The jaw is robust with non-pendent lips. The teeth should meet in a scissors bite. The almond-shaped eyes are dark red or brown-black. The mobile ears hang long on its cheeks. The body has a strong protruding sternum and a moderately retracted abdomen. The tail is carried in line with its back. 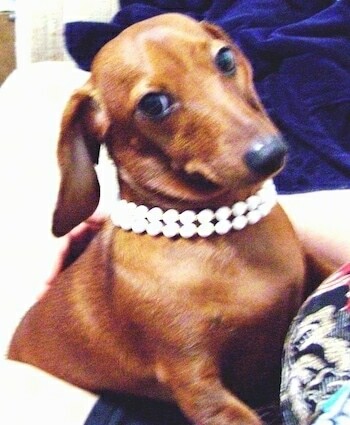 The short-haired Dachshund's coat should be shiny, sleek and uniform. 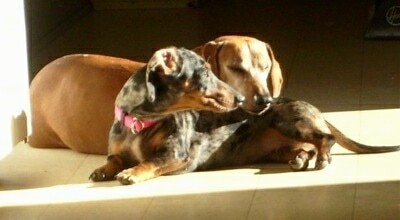 The Dachshund is curious, clever, lively, affectionate, proud, brave and amusing. Devoted to its family, it can be slightly difficult to train and housebreak, but not impossible. Dachshunds travel well. This little dog needs an owner who understands how to be his pack leader or he will take over the house, and begin to try and tell the owner what to do. If the dog is allowed to take over, many behavior problems will arise, such as, but not limited to, guarding furniture, separation anxiety, guarding food, toys or other objects, snapping, biting and obsessive barking. It will become unpredictable with children and adults they do not know. If it gets really bad, it may become unpredictable with its owner. They are usually recommended for older, considerate children, simply because most owners do not display proper pack leadership to small dogs, causing moderate to severe protectiveness, a behavior that can change if the humans start being their pack leader. If they do get the proper leadership, they can get along well with children. This breed has an instinct to dig. They are generally okay with other pets; however, once again, without proper leadership from their humans, they can be jealous, irritable, obstinate and very quick to bite, sometimes refusing to be handled. If you allow your little dog to take over your house, the dog will try his hardest to keep all of his humans in line—a weight which should not be placed on any dog's shoulders, especially one as sweet as a little dog like the Dachshund. These negative traits are not Dachshund traits, they are small dog syndrome traits. Meaning, most owners treat their small dogs like babies, rather than giving them leadership, As well as rules they need to follow along with limits they are, and are not allowed to do, which all dogs instinctually crave. Dachshunds that have human leadership along with a daily pack walk are wonderful family companions with excellent temperaments. Standard: Height 8 - 11 inches (20 - 27cm); Weight - over 11 pounds (4.9 kg) at the age of 12 months. Miniature: Height up to 5 - 7 inches (13 - 18 cm); Weight 11 pounds (4.9 kg) or less at the age of 12 months. The nickname "tweenie" is often used unofficially when the size falls between the miniature and standard. The Dachshund originated in Germany in the early 1600s. 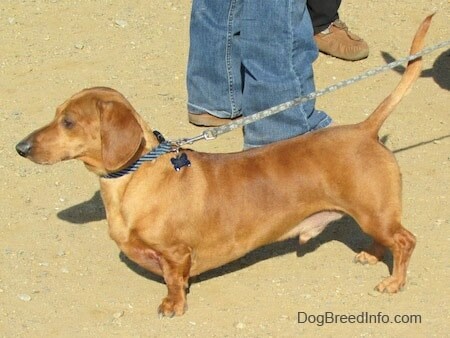 Bred to hunt small game such as badger and rabbit, the Dachshund has shortened legs to hunt and follow these animals to ground inside the burrows where they could fight the prey to the death. "Dachs" is the word for badger. Smaller Dachshunds where bred to hunt hare and stoat. 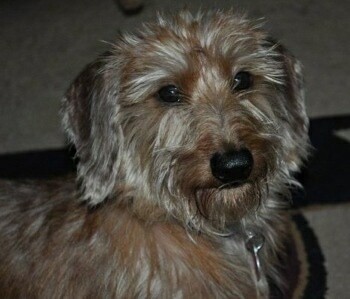 Dachshunds have many "terrier" characteristics. They are versatile and courageous dogs and have been known to take on foxes and otters too. The breed’s population dwindled during World War l, but dogs were imported from Germany to the USA and the gene pool once again increased. The Dachshund was recognized by the AKC in 1885. 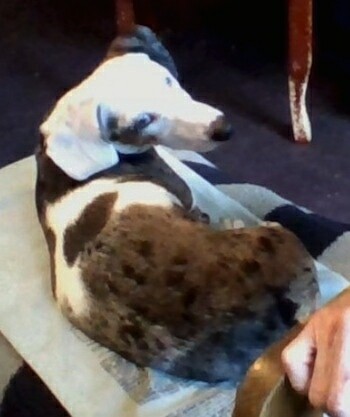 MISSING—"This is Buddy, my 14-pound, almost two-year-old silver dapple tweenie Dachshund and on the 16th of April 2010 while we were out of town, some friends were dog-sitting him for us. They took him out for a morning walk; he slipped out of his collar and took off. He is still missing, if you have seen him email me at birdgerd@yahoo.com and title the email Buddy. He was lost in Salmon Creek in Vancouver, WA, but he could be anywhere. It was very strange that he would do this. He has NEVER tried to slip out of his collar in the past; I guess he is just that loyal to us." Turbo the dapple Dachshund at 2 years old—"His name fits him. He's hyper but at the same time he's very lovely." Bentley the Mini Dachshund at 9 months old—"Bentley was given to me by a friend of mine, who owns his mama and daddy and he's been a delight! He's deaf, but if you're not told, you'd never know it! He knows hand signals/signs though, so he knows all of the things a hearing dog knows. He's super smart and he has blue eyes, but one is sky blue and the other is 1/2 sky blue and 1/2 REALLY DARK blue. Wherever I am you'll find Bentley right behind me, even in the bathroom. He cries the entire time I take a shower, don't ask me why! lol Bentley is my beautiful boy." "Scrappy (behind) is a 7-year-old male standard Dachshund and Moxie (in front) is a 9-month-old female miniature silver dapple Dachshund." 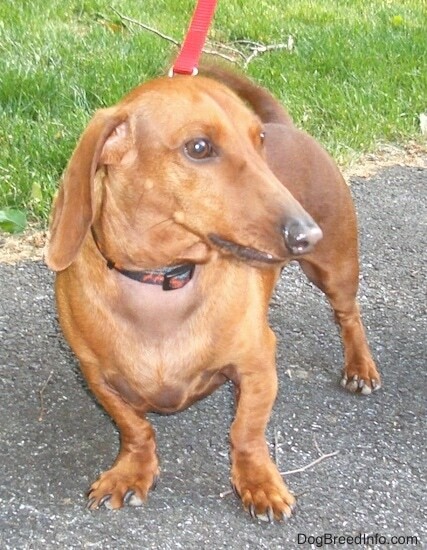 "Russell is a one-year-old red wirehaired Dachshund. He’s a happy-go-lucky guy who loves everyone, he always finds a way into your lap so he can lick your face and cuddle with you for hours. He was an anniversary gift for my mother, as this was always her dream dog. He’s just the sweetest little guy!" 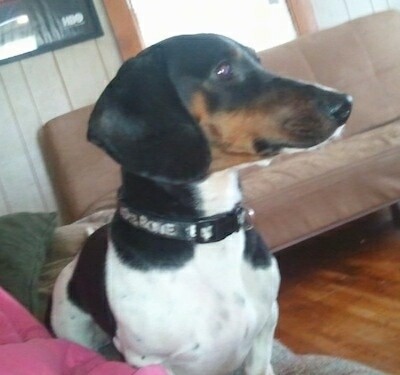 Oreo is a beautiful, active, silly, longhaired, piebald mini Dachshund. 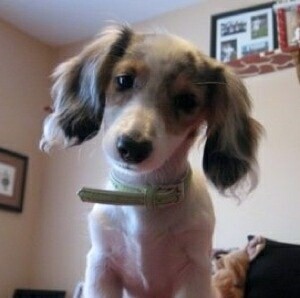 "This is Avery, the longhaired miniature Dachshund at about 5 months old. 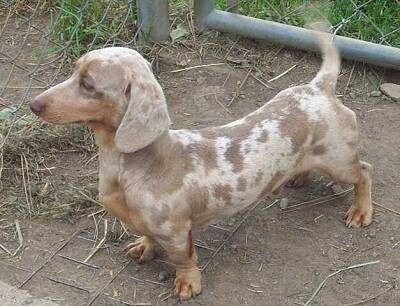 She is an English cream piebald dapple Dachshund and is the epitome of the breed. She loves to hunt, dig and bark and her favorite pastime is chasing birds and rodents in the yard. Though she may seem like a "prissy dog," she definitely knows how to get dirty! She is a stubborn little girl, but absolutely loves to cuddle up on the couch under a blanket with me." 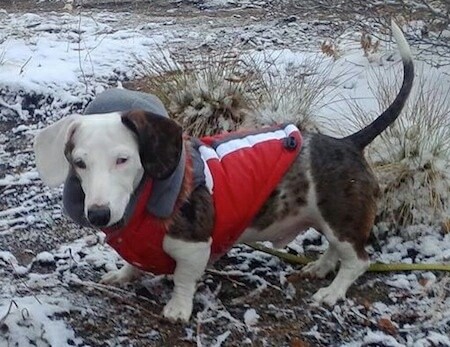 "Oscar is a five-year-old rescue Dachshund from Hearts United for Animals, a no-kill shelter in southeast Nebraska. He's been with us for almost a year now. He is one spoiled baby! 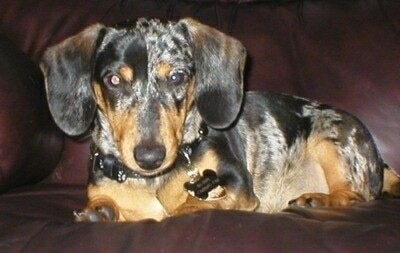 He is a black and tan "Tweenie," (between a standard and mini). He was adopted with his "sister" Dollie. They came from the same home and were put out by their former owners at a garage sale with a sign "Free to a Good Home." We urge support of no-kill shelters and support abolishment of puppy mills!" 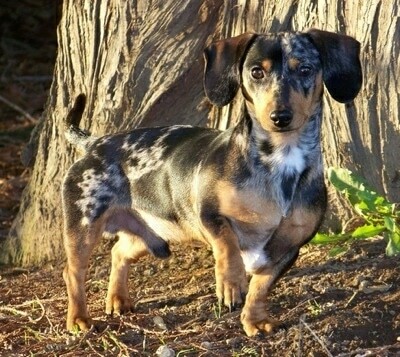 "My dog is a dapple mini Dachshund, shown here at 5 months old. Buddy is a very laid back kind of guy because I take him for walks every day, which he really likes. Buddy is so smart; I taught him sit, lie down, roll over, shake, speak, play dead, and circle (that is where he will run in a circle). He also can sit and lie down at a distance. I want to get him his CGC (Canine Good Citizen). It is so funny watching him play with a chocolate Lab that I walk. We have to be careful when they play because of the size difference. Buddy is so submissive around other dogs; he will walk up to another dog and plop down on his back. I have raised him Cesar's Way from day one and I want to be a Dog Whisperer. Buddy is definitely a balanced canine. I have all of the Dog Whisperer seasons on DVD and read all of his books. I am a big fan and my dog has been balanced from day one. I am a dog walker right now and I walk every dog Cesar's Way and so Buddy gets to be in a pack of dogs."